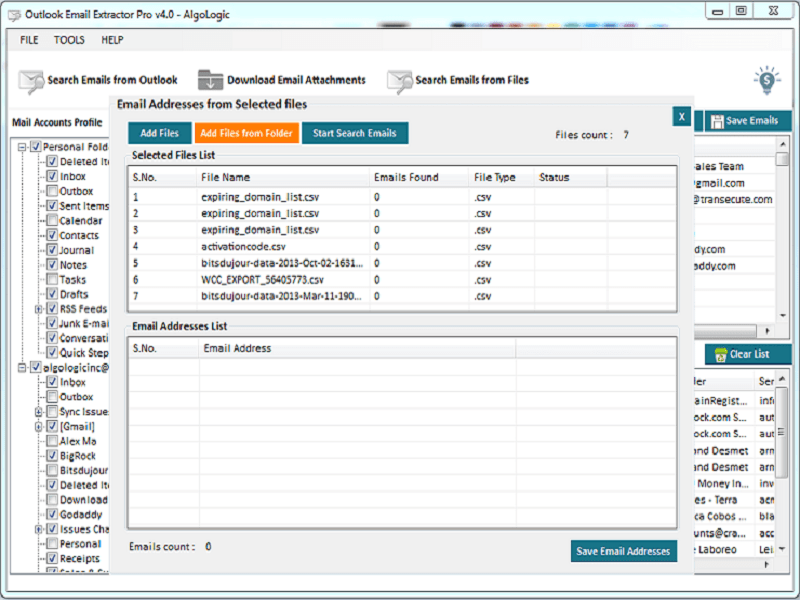 Outlook Email Extractor Pro v4.0 Manual process of collecting email addresses from cc, bcc, sender, recipients, subject, mail body and attachment files (.pdf, .doc, .xls, .ppt, .csv, .txt) from Outlook emails is a huge time taking.Outlook Email Extractor Pro v4.0 does all tasks for you in few clicks and extract all email addresses list with sender’s name from Outlook to Excel. Outlook Email Extractor Pro v4.0 is a best software to extract email addresses from Outlook and attachment files (.pdf, .doc, .xls, .ppt, .csv, .txt) in Outlook emails. Outlook Email Extractor Pro v4.0 collects email addresses list from subject, mail body, cc, bcc, sender, recipients and attachment files of emails in Outlook. It extract email addresses and attachments from all emails and mail folders (Inbox, Sent Items, Outbox, Drafts, Deleted Items and other user folders) in Microsoft Outlook. Outlook Email Extractor Pro v4.0 allows you to select specific file types to download from Outlook emails in defined folder in your computer. It also have option for extract email addresses from downloaded attachment files from Outlook emails. Outlook Email Extractor Pro v4.0 eliminates duplicate email addresses automatically to provide you only valid email addresses list from Outlook. Extracted all email addresses list with sender’s name can be saved in xls / csv / txt file. It supports Microsoft Outlook 2013, Outlook 2016 and Office 365 and free trial available for Windows operating system. Key Features… Display all email accounts configured and allows you to select any mail folder in Microsoft Outlook. It allows you to select file type to download from email attachment in Outlook. Attachment files can be saved in defined folder and extract email addresses from only selected files. Option available to have only required email addresses from Outlook emails with sender’s name. Duplicate email addresses eliminated automatically from list. Extracted email addresses with names can be saved in xls / csv / txt files. It Supports Outlook 2013, Outlook 2016 and Office 365. Outlook Email Extractor Pro v4.0 available for free trial download for Windows with Limited functions.